These little treats are packed BIG with flavour, you can use a plain biscuit base if preferred. Preheat the oven to 140C/275F/Gas Mark 1. Break the biscuits into a food processor bowl, and pulse until the biscuits resemble breadcrumbs. 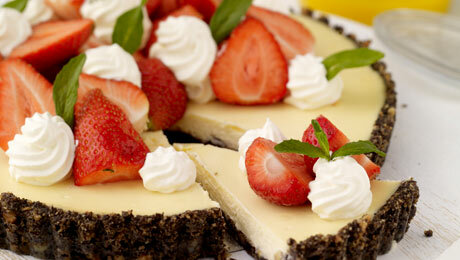 Pour in the melted butter, then press the biscuit crust into the base and sides of the 25cm cheesecake tin. Place in the fridge for 15 minutes. In a bowl, using an electric whisk beat the cream cheese, crème fraiche, honey, eggs and vanilla essence. Beat until the mixture is smooth then add the lemon juice and zest. Place on top of the biscuit layer and place in the oven for 15 minutes until set. Remove from the oven and allow to cool, then transfer to the fridge to chill. Before serving add sliced strawberries to the cheesecake. Blend the mango and icing sugar together in the blender until smooth and pour into a jug and chill until required. Whip the cream until stiff. To serve, place a slice of the cheesecake tart onto the centre of a plate and add a spoonful of fresh cream or ice-cream and drizzle with a little coulis. You will require a 25cm (10") cheesecake tin for this recipe.